I am a big lover of sequins and sparkles and I have always loved jewellery that adds a touch of glamour to an outfit. When Buckley London* kindly contacted me about the new collections, I was instantly drawn to the new Kensington collection, but let's start from the beginning. 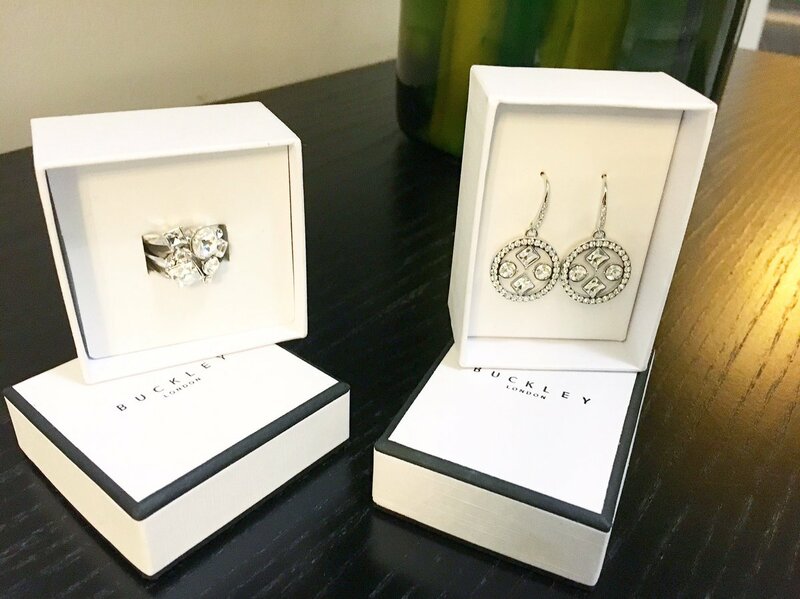 If you haven't heard of Buckley London, the luxury jewellery brand has been worn by the likes of Kate Middleton and Ellie Goulding. It was created in 1989 and they certainly have a large amount of experience when it comes to creating luxury jewellery, from packaging to presentation. The Kensington collection really stood out to me and for the past year I have only worn silver jewellery instead of my usual choice - gold. I love the bold silver gems on the delicate chains and I think this makes the collection very wearable and especially ideal for the winter season. As we all know, for my earrings, I usually wear simple diamond studs but I actually picked silver, disc drop earrings to branch out slightly. I instantly feel party session ready wearing them and it is amazing how much of a difference a pair of earrings can make. For the Kensington Ring, this was one of my first choices. The bold design is my idea of heaven, the ring itself is very thin and dainty but the gems add an instant party vibe. If you are starting your Christmas shopping list, I think the Kensington collection would make a great gift but if you prefer very simple or subtle jewellery, the Lunar collection is a great starting point because the designs are incredibly delicate and add a touch of sparkle without being too overpowering. I love that Buckley London offer a different style to suit different tastes. This is simple economics. The online store does not need to pay for the space at the mall, the cache of replica watches uk and the price of presence. So, when you see that replica watches sale at the mall, check its price online before you purchase at the brick and mortar store. So, let's take a look at the five best luxury watch deals that you can find online for this rolex replica sale category for men. This is because their line of watches is elegant, masculine, sporty and priced better than the other brands. Their replica watches sale offered at the mall for over $1,500, can be had over the Christmas season for $850. The Aquaracer is Tag's most powerful product line and simply looks stunning. Tag Heuer also offers their breitling replica at great holiday savings. From the same Aquracer product line, this breitling replica watch has a classic look and feel. It is available right now at a savings of over $1,000.